Centre of Nice, Lge luxury two bed apt., sleeps 6, air-con., two balconies. Access to Promenade des Anglais, beside rests., bars, designer shops. Located in Les Résidences du Palais de la Méditerranée which offers its residents a mythical address in a golden triangle between the Rue de France, the Rue du Congres and the Promenade des Anglais. Experience the best of Nice in a prime location in the centre of Nice. There is a Guardian in the complex, which has a video entry phone system, which makes it very safe. 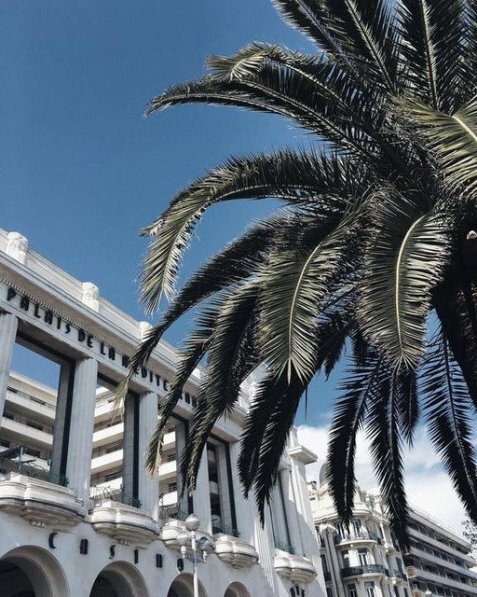 Direct pedestrian access to the legendary Promenade des Anglais, lined with palm trees and luxury hotels. MINIMUM RENTAL PERIOD IS SEVEN DAYS, however, if there is an in-fill of 4-6 days between bookings, we can facilitate this, please send an enquiry. TIMES SHOWN TO THE LEFT, WITH THE EXCEPTION OF, TIME TO THE AIRPORT (by bus or taxi) ARE TIMES ON FOOT. No need for a car, as public transport is very accessible and very reasonably priced. The apartment is located on the second floor of the building and is served by a lift, but stairs are closeby. One living/dining room - dining table accommodates six people. Large sofa bed, which will sleep two adults and second seater couch. Bookcase with a selection of books, stereo and selection of CDs. Television with 88 TV channels (Sky, BBC, CNN, MTV, etc.). DVD player with a selection of DVDs. You can also use your own USB for stored entertainment. Marble floor with electronic shutter for complete security and full black-out. Patio doors to the 15M² south facing terrace, which overlooks a private quiet garden and accommodates a table, four chairs and sun loungers. Fully equipped modern kitchen - breakfast / dining table, oven, hob, electric kettle, toaster, microware, fridge/freeze, dishwasher and washing machine. Terrace overlooking a private quiet garden, accommodating a table and four chairs. One double bedroom with European kingsize bed (160cm X 200cm), built-in wardrobes and luxury fully tiled ensuite bathroom with the finest marble on the floor. Flatscreen TV/DVD in main bedroom. Wooden floor with electronic shutter for complete security and full black-out. Patio doors to the south facing terrace, overlooking a private quiet garden. One twin bedroom with 90cm single beds, which will convert to a double bed, including built-in wardrobes.Wooden floor with electronic shutter for complete security and full black-out. Patio doors to terrace, which overlooks a private quiet garden. One separate shower room, with hand basin. One separate WC, and hand basin. Terrace is equipped with table, chairs and sun loungers, as well as lighting and power. Ample storage in the bedrooms and kitchen. Travel cot available for young child. Cot linen not supplied. The city's main seaside promenade, the Promenade des Anglais ("Walkway of the English') owes its name to visitors to the resort. It was built in 1820 by an Englishman, Lewis Way, for afternoon constitutionals. Today this palm tree lined promenade is used by walkers, joggers, cyclist, and roller bladers. The promenade runs the length of Nices ocean front, approximately 7 km. For decades now, the picturesque Nicean surroundings have attracted not only those in search of relaxation, but also those seeking inspiration. The complex includes the Residences and a 4 star+ newly restored art deco hotel and casino, Le Palais de la Méditerranée, now one of the "leading hotels of the world". The hotels façade is now a national monument and dominates the Promenade des Anglais. Le Palais de la Méditerranée originally opened to unprecedented acclaim in 1929, instantly becoming a showcase of luxury and inter-war celebration. Designed by architects Charles and Marcel Dalmas, its prestigious inauguration included an impressive line-up of celebrities and politicians from France and abroad, all invited as guests of American billionaires Franck and Florence Gould, already famed for the creation of Juan les Pins. From the unveiling of the art deco façade, the early 20th-century visitors marvelled at the sculpting of Satori, the white marbled lobby, the massive staircase, the stained glass windows, the precious woods and the sparkling crystal chandeliers. Hailed as a gaming palace, the casino rooms enjoyed some of the most stunning views over the Mediterranean through enormous picture windows. A 1,000-seat theatre attracted the greatest names in the world of arts and entertainment, among them Maurice Chevaliers, Jules Romain, Edith Piaf and Josephine Baker. In a very quiet area, no traffic noise, two balconies, south & north facing, both overlooking internal private gardens. Individual air-conditioning / heating controls in the lounge and bedrooms. The system is by a central heat pump, either in ‘’Cooling’’ or ‘’Heating’’ mode. Change-over is twice a year - early summer & late Autumn, at the discretion of the local residents, based on weather conditions. 42" plasma TV in the lounge, with Terra Drive for viewing TV recorded shows and films as well as for music listening . Your own USB can be used for viewing and listening. Also flatscreen TV/DVD in main bedroom. The apartment has wireless broadband internett access- access key given in guest information. Smoking is allowed on the balconies. Minimum rental period is 7 days, if there are 6 days available between two bookings, we will accept this period. Please "Make an Enquiry" if this period is available and you are interested.